All current year NVYW students will be welcome to return next year without audition. Seating placement auditions will occur in the fall. Rising freshman (those 8th graders currently in Junior Winds) will be automatically placed in Senior Winds. Sign up for auditions at the links below. Tuition for the 2019-2020 season will be $275, due on confirmation of participation. This reflects a tuition decrease from the 2018-2019 season. NVYW Symphonic Winds is open to students, grades 9 – 12, and NVYW Junior Winds is open to students, grades 6 – 8, who are members in good standing in their public, private, parochial or home school band. Placement and/or seating of students in their school band will not be considered in determining acceptance or placement in Symphonic Winds / Junior Winds. Selection to the ensemble will be determined by successful audition and instrumentation needs. 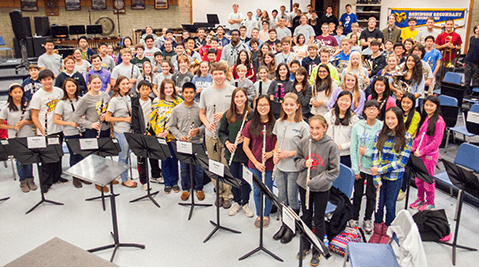 To support the mission and educational focus of high schools in Fairfax County and the Northern Virginia region, auditions for NVYW will closely parallel expectations for district and state ensembles. Students will be asked to prepare one or more excerpts, of their own choosing, not to exceed two minutes in length, which will demonstrate technical facility, maturity of tone and expressive content. Selection of performance excerpts is the choice of the player, in consultation with his/her music teachers. Percussionists will be expected to prepare excerpts on at least two of the three percussion disciplines: Snare, Mallets and Tympani. All students will be asked to perform major scales (Junior Winds, major scales up to 4 sharps and 4 flats), chosen by the audition committee, and the chromatic scale over the range of their instrument, according to the information below. There is no requirement for sight-reading. Need-based scholarships may be available. Applications will be made available at the time of acceptance and due upon confirmation of participation.